Thank you for the encouraging comments from last weeks post. They really made my day and added to the pressure a bit which is actually a good thing. I hope to not disappoint. My question for you is – what’s your pattern? What do I mean by that? What’s the pattern that you’ve been dreaming of for your home – be it in form of wallpaper or fabric? For me, it’s Osborne and Little Best In Show wallpaper in the flocked version. I remember when I first laid eyes on the paper way back in October of 2010 as a young newlywed living in a Chicago rental on a student budget. It was mearly a pipe dream then and so I blogged about it and dreamt about it and waited. Then two years ago my brother and sister in law redid their home and papered their bathroom with the flocked Best in Show paper. I was that much closer to my pipe dream. The second it was installed, I drove across the bay to Oakland and attempted to hug the walls and then I stood there for forty five minutes or so naming the dogs on the paper. And now, my dear friends and family, it’s my turn. The famed paper is in my home that we own and can put permanent wallpaper on the walls if we want to. It’s happening!! 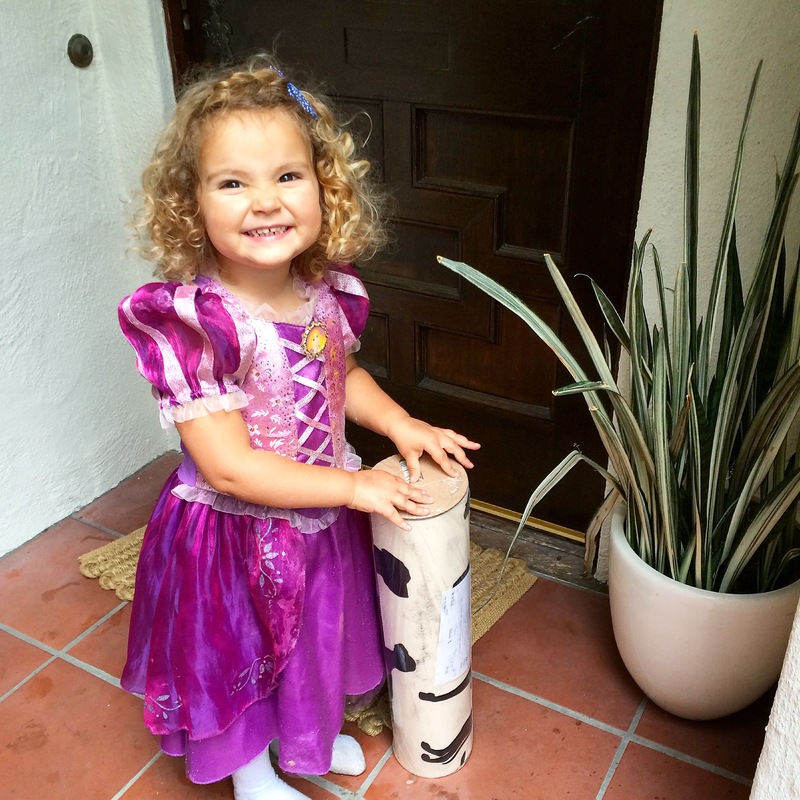 Josie, my oldest daughter, was in a princess costume when the paper arrived. I found it so fitting that she should be dressed like royalty when the paper arrived all the way from England. There’s a catch…isn’t there always? My wallpaper installer, whom I trust with my life and love and adore and really can’t speak more highly of, is in high demand in the silicon (everyone’s redoing their homes) valley. He can only come on November 12 – the very day that the One Room Challenge reveal is and that was me booking him three weeks ago. I am on his cancellation list so I’ll be called if anybody cancels. Everyone please pray for a cancellation!! Come on baby!! On with the rest of the plan. I will be painting out the woodwork in the closet pink. 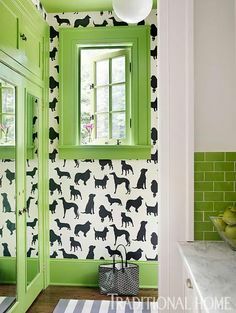 I thought I was taking a bit of a risk when I came up with this idea and then I ran across this mudroom by Katie Rosenthal and it made me feel all the better. The pink will match the Sister Parish fabric that’s in the above mood board; the fabric will be used for cafe curtains for the window in the closet. At least that’s the hope. 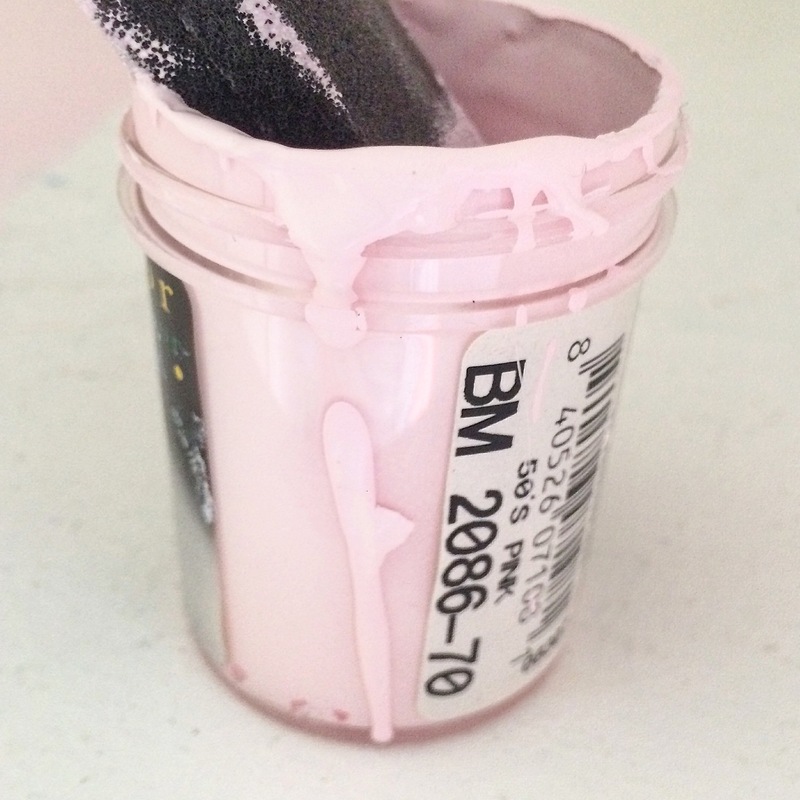 A good pink paint is impossibly hard to find. I’m still throwing samples up on the walls. 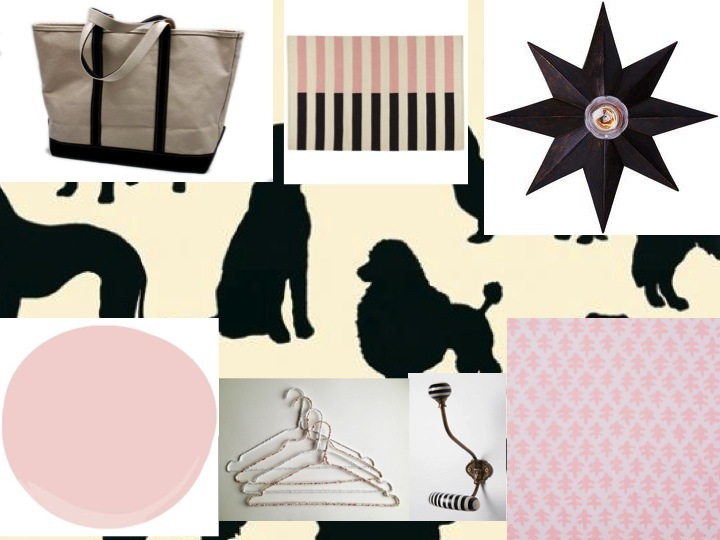 I think I’ve narrowed it down to the paint (50’s pink by Benjamin Moore) and this weekend I plan to paint the closet. Since all I’ve done so far is order things. It’s time for me to get painting, while I do that, please check the other participants, here. Oh Kate, that paper is like a Love Affair. . . too amazing for mere words. And the pale pink trim will just add to it’s allure! You had me @ Best of Show, but I look so forward to the whole thing! That you and Sister in Law have and love the same paper is a Testament. You go girls. Kate, that paper is meant to be and how much more special but to use it in your daughter’s space!! And, my jaw nearly hit the ground when I read the challenge reveal is on 11/12!! What? I thought it was the 11/19 (six weeks from 10/8)? Am I losing it?? Okay, if this is the case, I’m in a bit of panic mode! Oh well! I love your designs – you take risks and I can’t wait to see this completed! !